Meningitis or Meningococcemia is caused by Neisseria meningitidis (Groups A, C, Y, W135) bacteria. It may be severe and life threatening. A variety of neurological and immunological complications are generally associated with the primary disease. 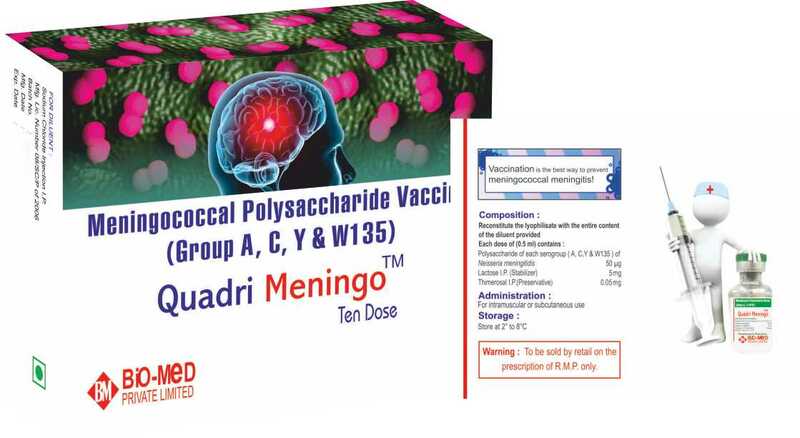 QUADRI MENINGO™ is to be used to protect against cerebrospinal meningitis caused by Neisseria meningitidis (Group A, C, Y & W 135). Quadri Meningo™ conforms to the I.P. Hajj and Umrah pilgrims heading to Mecca, Saudi Arabia. Children and adults exposed to infected patients. Recommended for children above 18 months of age as routine immunization in endemic areas. Travellers heading to disease prone areas should be vaccinated at least 15 days in advance. During epidemic, children between 3-18 months need to be vaccinated 3 months apart. Revaccination is recommended in children at high risk areas who were vaccinated below 4 years of age. QUADRI MENINGO™ is available in single dose vial with syringe and 10 dose vial packing along with appropriate diluent. Reconstitute the lyophilisate with the entire content of the diluent provided with vaccine vaccine. Inject 0.5 ml as S/C or I/M injection. Ongoing acute or chronic illness like fever, severe infection, persistent diarrhoea, vomiting. Reaction to vaccination generally consists of localized injection site reaction ( Pain , redness) , transient hyperthermia , headache,vomiting in children etc. Store at 2° C to 8° C in refrigerator. Product is good to use for 24 months from the date of manufacture. W.H.O has recommended use of Quadrivalent Vaccine (containing A, C, Y & W 135) in place of bivalent vaccine (containing only A, C ) specially in areas like India where group specific meningococci – causing the disease have not been identified.